From I-64. Take exit 238 (Route 143) and go one-half mile. Turn right on Route 132 South. Pass through the Route 60 By-pass intersection. Cross over the railroad tracks. Turn right at the stoplight at Lafayette Street. Go approximately 0.4 miles and turn left onto Harrison Avenue. Proceed two blocks and turn right onto Richmond Road. Go one block, our Inn is on the corner of Dillard Street and Richmond Road on the left side. 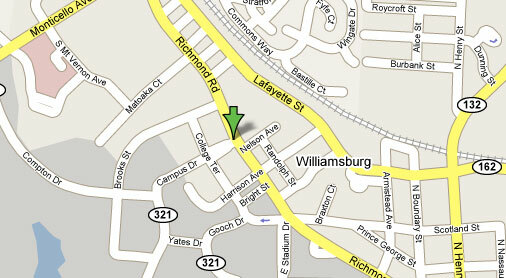 A spacious parking lot is located behind our Williamsburg Bed and Breakfast on Dillard Street. Please don't hesitate to phone us if you need additional assistance!